The Napanee Peewee BB Crunch have taken over first place in the East Division with two wins on the weekend. On Saturday, they travelled to Clarington to take on the Flames. It was a tight checking game through two periods. Keyra Herrington stopped a key breakaway in the second period to keep the game scoreless. Midway into the third, Kristen Sutton took a pass from Alaina Holmes and skated across the middle of the ice and fired a hard shot into the net. She then added another goal assisted by Ava de Almeida. Napanee dominated the play through the third period, not giving Clarington a chance for a comeback. 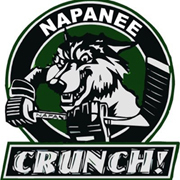 On Sunday the first place Peterborough Ice Kats came to Napanee to play the undefeated Crunch. Napanee’s Taryn Landine potted a goal early in the third period assisted by Nicole Geenevasen and Sienna Eberle. Kristen Sutton scored in the second, assisted by Claire McConnell. A late third period penalty gave the Ice Kats some life as they scored with three minutes to go. The Crunch would hold them off and secure the win and a swap in the standings putting them in first place. Diana Wharton was great in goal again for the win.